After conquering Hollywood in The Muppet Movie and foiling British jewel thieves in The Great Muppet Caper, the Muppets set their sights on Broadway in their third feature film, The Muppets Take Manhattan. The 1984 movie chronicled the efforts of Kermit and his gang to bring their school musical, Manhattan Melodies, to Broadway. Over the course of the film, Kermit loses his memory and almost loses Miss Piggy, only to end up on stage in a musical wedding scene and elaborate production number. Shooting over the summer of 1983, Jim and the team did some final production work, re-recording some of the dialogue in December. Muppets Take Manhattan was a fun project for all involved. For the first time, Frank Oz had an opportunity to independently direct a full feature film, launching his career on that trajectory. The shoot was a joy for Jim, working with his friends in his own backyard, able to sleep in his own bed in his new Sherry-Netherland apartment after a day of shooting. With Frank at the helm, Jim could relax, knowing his characters were in expert hands, and he could enjoy the range of personalities that Kermit got to display in the film. With the introduction of the Muppet Babies in a fantasy sequence, a whole new range of production possibilities opened for the Muppets, and Jim was excited to see where those would go. Jim loved theater and had tried to develop his own show over the years. Being able to create a fictional Broadway show for the film helped, in a small way, satisfy some of those ambitions. 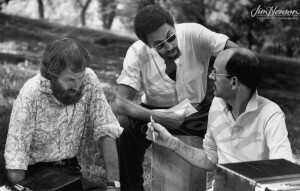 It also gave him a chance to work with one of his Sesame Street colleagues outside the television studio, composer Jeff Moss (known for hits like “Rubber Duckie”). The music worked well for the story, particularly the wedding-related songs like “Somebody’s Getting Married” and Miss Piggy’s soaring “He’ll Make Me Happy”, both of which added to the intrigue about whether or not the wedding was real. Audiences responded to the music, often requesting to use it at their own weddings, and Moss was nominated for an Academy Award for Best Score. 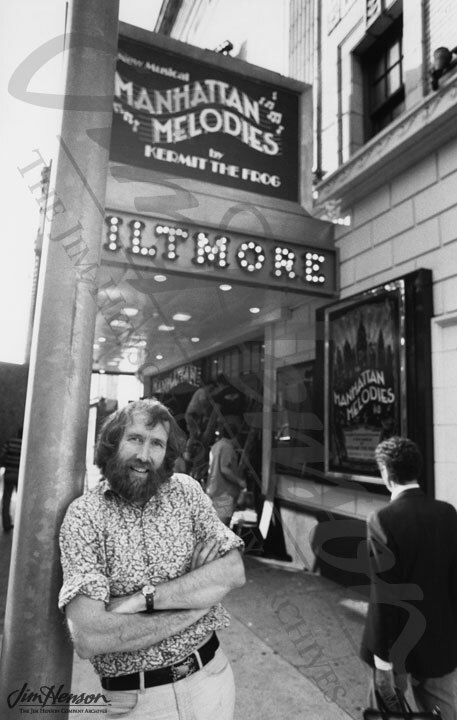 Learn about Jim’s promotion for The Muppets Take Manhattan. Jim, actor Gregory Hines, and Frank Oz getting ready to shoot in Manhattan’s Central Park, 1983. 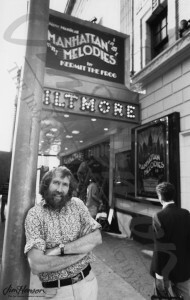 Jim at the Biltmore Theatre whose marquee featured the Muppets’ fictional Broadway show, 1983. 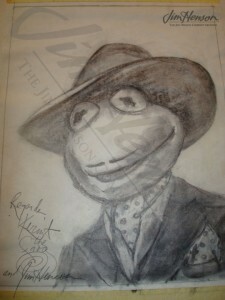 Kermit’s faux Sardi’s portrait showing him disguised as a Broadway producer in The Muppets Take Manhattan, 1983. This entry was posted in 12-December '83, 1983, Muppets Take Manhattan and tagged Frank Oz, Jeff Moss, Miss Piggy, Muppet Babies, Sesame Street, The Great Muppet Caper, The Muppet Movie, The Muppets Take Manhattan. Bookmark the permalink.